The nearest LTC site to my home is about forty miles north, in Poughkeepsie, where there are about a dozen or so LTCers. Since it is difficult to build and create relationships within a worldwide team, LTC management has created “Morale” groups at various sites, and as part of that, I journey last Thursday to Poughkeepsie to join a “Morale Lunch,” which is a high-faluting way of saying I drove to POK so I could chow down with some fellow LTC members, and then chat with some of them during the afternoon. 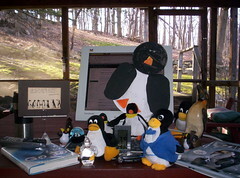 I took along many members of my Linux Menagerie, a group I call “The Tuxers,” for not only is the Penguin the mascot of Linux, the Penguin has been my favorite animal for many decades. I took along a camera, both to take some pictures of the chow-down for inclusion in the next quarterly LTC newsletter (my manager helps put the newsletter together, and so had asked I take some pics while in POK). 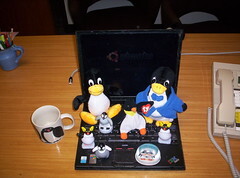 I assembled the Tuxers for their first group photo in Smart’s office. It can be found at the start of this post. It’s a bit cold today, so I fired up a small space heater I use to keep my hands warm. The Tuxers then came over to investigate this strange new device, probably to see if it was supported by Ubuntu. I didn’t let them know that it was a heater. Tuxers: Is there a Linux device driver for this? The Tuxers are already #14 on the Google list of matches for “tuxers,” just a day after I first announced their existence. I’ll update this when they reach #1, and will flog this blog as needed to achieve that goal. 1. Those in the LTC will understand why Diane suggested I use Smart’s office, for I was about to have a call with Mark V, a famed LTC member who has been continuously on the phone talking about Linux since before Linus started writing it. 2. (Added 10/31/2007) I just noticed that someone reached my blog by searching for “adobe acrobat error 1336,” proving I am not the only Adobe customer who has had this problem. This entry was written by daveshields, posted on October 30, 2007 at 12:42, filed under open-source and tagged open-source. Bookmark the permalink. Follow any comments here with the RSS feed for this post. Post a comment or leave a trackback: Trackback URL.